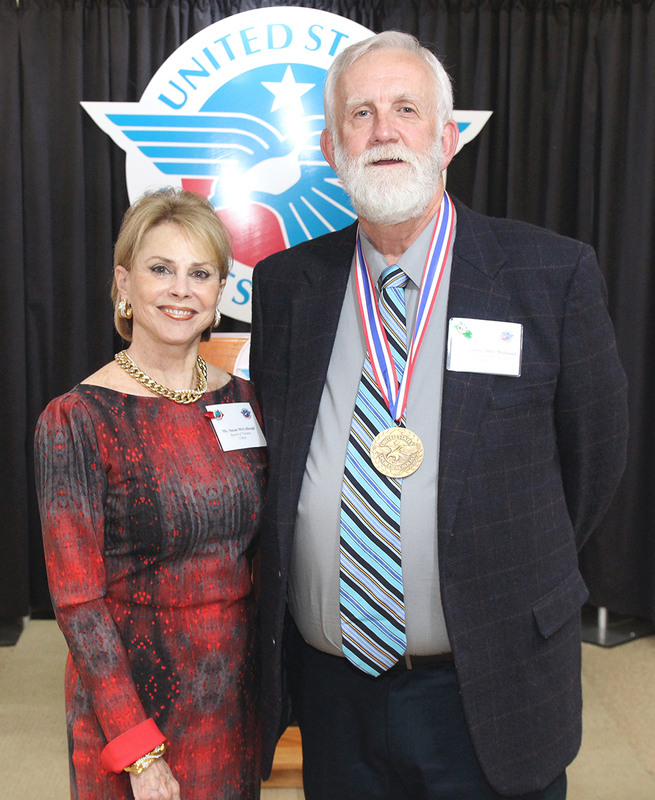 Nationally known American sports painter William “Bill” Williams, right, has been named the United States Sports Academy’s 2017 Sport Artist of the Year, Painter. Williams was presented the honor by Academy Trustee and Art Committee Member Emerita Susan McCollough at the Academy’s 33rd Annual Awards of Sport celebration held recently on campus in Daphne, Ala.
DAPHNE, Ala. – Nationally known American sports painter William M. Williams, whose work is featured in some of the most prestigious and notable sports locales in the country, has been named the United States Sports Academy’s 2017 Sport Artist of the Year, Painter. Williams was presented the honor by Academy Trustee and Art Committee Member Emerita Susan McCollough at the Academy’s 33rd Annual Awards of Sport celebration held recently on campus in Daphne, Ala.
Williams is widely respected for his classical artistic approach to representing the glory of sports through his realistic still life oil paintings, which often depict uniforms, equipment, memorabilia and other items reflective of the sport he is representing. His work is in the permanent collections of the National Baseball Hall of Fame, the College Football Hall of Fame, the Commissioner of the National Basketball Association, the New York Yankees, the U.S. Military Academy at West Point, the U.S. Naval Academy and the Butler Institute of American Art. He has won numerous awards including the Lake Orion Art Center Award, Best of Show in the Art of Golf Festival in Pinehurst, N.C., and Best of Show at an Ohio statewide art competition. The Sport Artist of the Year Award is part of the Academy’s Awards of Sport, which each year honor a wide range of accomplishments in sport and serve as “A Tribute to the Artist and the Athlete,” in conjunction with the Academy’s American Sport Art Museum and Archives (ASAMA). The awards recognize these men and women through the Sport Artist of the Year, Honorary Doctorates, Medallion Series, Distinguished Service Awards, Outstanding Athletes, and Alumni of the Year awards. 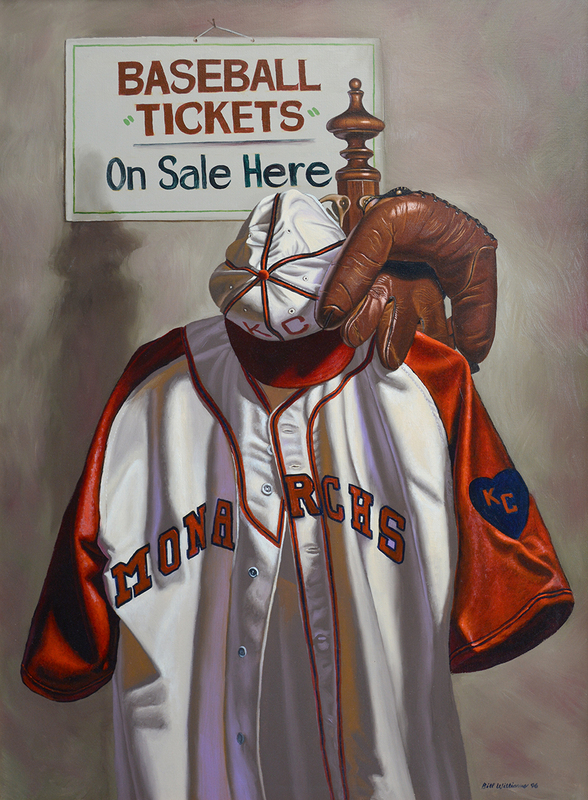 William M. Williams, the United States Sports Academy’s 2017 Sport Artist of the Year, Painter, recently donated “Satchel’s Monarchs” to the Academy’s American Sport Art Museum and Archives (ASAMA). The painting honors legendary baseball player Satchel Paige. The work is on permanent display at the museum. A native and resident of Battle Creek, Mich., Williams earned his bachelor’s degree from Alma (Mich.) College and master’s degree from Boston University. He was a varsity athlete in high school and college and began his work as a professional artist in 1989. Williams has earned national acclaim for his sports art, but his work also includes oil and pastel portraits. “My still life paintings are created to allow viewers to feel an emotion or memory that has been important to them,” Williams said. “The creation of these works allows me to express ideas that can be best relayed through images. All of this is done with the idea of creating a beautiful piece of artwork and at the same time represent the history of sports, teams and athletes. Williams has been commissioned to create works of art for numerous significant sports events, including the program, ticket covers and limited edition prints for the 100th Army vs. Navy football game; limited edition prints for Cal Ripken Jr. when he broke Lou Gehrig’s consecutive games record; the College Football Hall of Fame induction ceremony program; and an original oil painting for Darren McCarty of the Detroit Red Wings. Other commissions include art for the University of Washington’s football program and the University of Oregon’s basketball program. His illustrations are featured in numerous publications and exhibitions around the United States. He illustrated “A Pitch in Time” by Robert A Lytle, a book which won the Benjamin Franklin Silver Award from the Publishers Marketing Association. He contributed artwork for the Chicago White Sox media guide and pocket schedule, the Bill Williams Calendar of Sports Images, the New York Yankees video scoreboard, the Oakland Athletics Magazine, Spitball Magazine, and the contributed illustrations for the book “Baseball: A Treasury of Art and Literature.” His work also adorned a MasterCard credit card. Williams’ works have also been featured at the Butler Institute of American Art in Youngstown, Ohio; the Grand Rapids Art Museum in Michigan; and the Kalamazoo Institute of Arts in Michigan. He also has works featured at the Wandering Oaks Fine Art Gallery in Wimberly, Texas, and in the Old Sport Gallery in Pinehurst, N.C., and Harbor Springs, Mich.
Williams has studied the arts extensively, including studying artists’ techniques at the Louvre in Paris, the National Gallery in London, the Alte Pinakothek in Munich, the Prado in Madrid, and the Uffizi in Italy as well as the New York Metropolitan Museum of Art, the National Gallery in Washington D.C. and the Chicago Art Institute.